More designer's notes in "the making of Blood Sword" series, this time another look at Doomwalk. (Part one here.) The covers of this and the previous book in the series, The Demon’s Claw, now credit me as the sole author. Originally Oliver Johnson and I signed to do all five Blood Sword books, but Oliver’s job at Random House meant that he had very little time to spend on them from the start, having to bail out altogether shortly after we started work on The Kingdom of Wyrd. He did return – sort of – for the final book, but one at a time, eh? Between The Battlepits of Krarth and The Kingdom of Wyrd, a week or so has passed. Between the latter and The Demon’s Claw, the characters are implied to have been adventuring for years. But Doomwalk begins with a Bourne-style cut, following on immediately after the events of the previous book. There’s no particular significance in this. I usually avoided cliffhangers because books couldn’t be ordered off the internet in those days, and I’d learned the hard way about the vagaries of distribution when all the copies of Dragon Warriors book 1 went to the south of England and all of book 2 went to the north. So I tried to make sure you could jump into a series like Blood Sword at any point and if you missed out a book entirely it wouldn’t be the end of the world. Except in book 5, when it really was the end of the world. But, as I said before, more on that in a later post. I was glad to have the chance to fix the maps, which in the 1988 edition were printed the wrong way round. So you were presented with a map of Sheol at the start of the book, and if you managed to get to the lands of the dead and if you were lucky enough to find the ancient carving on a monolith there, you would uncover… a chart of western Legend showing the location of the island you needed to find in order to reach Sheol in the first place. I was aiming for a certain amount of dream logic, but not in Lewis Carroll quantities. So after twenty-six years it’s nice to be able to put the maps back where they belong. Talking of maps, I noticed that the artist (not Russ Nicholson; he wasn't the original map artist) had written “burrow downs” instead of “barrow downs”. I’ve never had much luck with artists and barrows. In one early gamebook I described the character crossing a desolate moor at night when an old man steps out from behind a barrow. That became a picture of a geezer with a wheelbarrow. 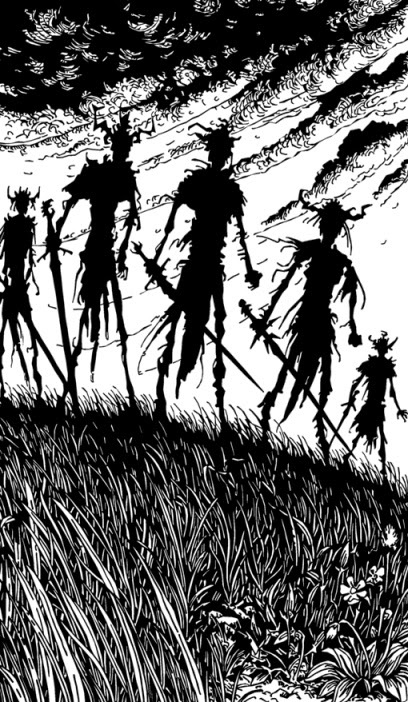 But I digress… All this talk of barrows at least gives me an excuse to run one of my top favourite of all of Russ's pictures, the wights who come out for a meet 'n greet when you arrive in Sheol. One more part of this reminiscence of Doomwalk to come. That's in a fortnight, and then we're on to The Walls of Spyte and the big Krarthian free-for-all on the final day of all Creation. But what about next Friday's post, you ask? Ah, or should I say Arrrrr!